Founding and GrowthKoguryo Builds Up a Great EmpireKoguryo’s Wars with Sui and TangDownfall and Succession of KoguryoThe Forgotten Glory of Koguryo Reviving! Koguryo was an ancient Korean empire whose brilliant history flourished on a vast expanse of land in East Asia. Koguryo thrived for 705 years from 37 B.C., when it was founded to A.D. 668, when it collapsed, and its historical achievements was the source of enormous pride to its descendants. Like most nations from that time, Koguryo started out from a modest beginning at the Zolbon area in the Yalu River valley. The founder of Koguryo was King Chumo, or Gojumong, who originally came from the State of Buyeo. When he left Buyeo and founded Koguryo, Gojumong was so hard pressed to afford a decent palace or secure sufficient grain output. Furthermore, the fledgling state was surrounded by stronger nations like Biryu, Seonbi, and Buyeo. So, unless one was strong enough, a weak nation was destined to subjugation to others as a feudal state. Soon, however, Koguryo developed strong leadership and military power, and began to pursue a policy of expansion by conquering smaller nations one by one. Conquering small neighboring nations like Biryu, Okjeo, Haeng-in and Yangmaek, Koguryo grew up to be a strong country that even overpowered Buyeo by the early first century A.D.
By the middle of the first century A.D., during King Taejo’s reign, Koguryo was able to absorb various foreign cultural elements on top of the cultural foundations of preceding kingdoms of Old Joseon (Korea) and Buyeo and established itself as a stable state with a systematic ruling structure. King Taejo successfully advanced into Liaodong and the plains of the northern Korean peninsula by attacking Later Han’s eastern Commanderies of Lolang, Xiantu and Liaodong, driving them out toward the west. during king Micheon’s reign, it successfully destroyed Chinese Commanderies of Lolang and Taifang altogether. Its early history was not smooth, however. 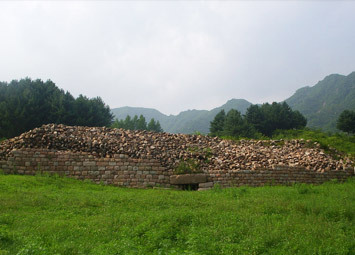 In 342, Koguryo’s capital once again fell into enemy hands during the invasion of the Moyong Seonbi tribe. It also sustained another severe blow in 371, when Baekje attacked it from the south. King Gogukwon died during this attack. 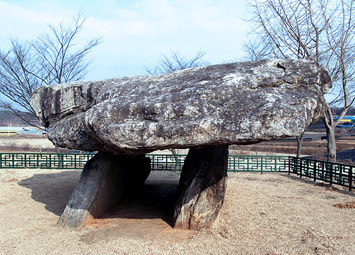 1) Korea Dolman in the island of Kanghwado, circa 20th centry B.C. King Gogukwon’s successors were Kings, Sosurim and Gogukyang. They began to overhaul the state’s internal institutions in a bid to overcome a series of crises facing Koguryo. Kings Sosurim and Gogukyang were able to solidify state power by firmly establishing social discipline through administrative laws and orders, providing ground for liberal thoughts by introducing Buddhism, and nurturing intellectuals with the creation of Taehak (National Academy). It was King Gwanggaeto (r. 391-413), who greatly changed the map of Koguryo by vigorously pursuing the task of adding new domains by conquest. The great military campaigns of this king made Silla in the southeastern part of the Korean peninsula a vassal state, and Baekje, Gaya and Japan its tributary states. To the north, it overpowered Suksin and East Buyeo and made them tributary states. To the west, Koguryo conquered the Khitan tribe along the middle and upper reaches of West Liao River and destroyed the Later Yen, set up by Moyong Seonbi tribe. 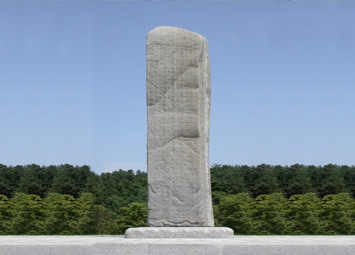 King Gwanggaeto was succeeded by his son, King Jangsu. During his 79 years on the throne, King Jangsu continued his father’s enterprises and brought Koguryo to its flourishing height. Koguryo’s power expanded further to the north, dividing the Jiduwu territory along the Greater Khingan Range with the nomadic empire of Yuyen. To the south, Koguryo exercised direct control over a region between the Gyeonggi Bay and the Youngil Bay in North Gyeongsang Province (the mid-section of Korean Peninsula). 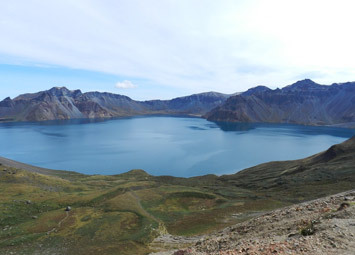 Subsequently, Koguryo continued to expand its territory until it reached the Eastern Songhua River in the north, Mt. Uimuryeo across Liao River in the west and the southern part of today’s Littoral Province of Russia. 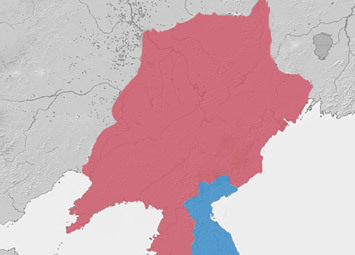 If its indirect control over nomadic tribes is taken into consideration in addition to the newly added territories, Koguryo at that time was a great power with its sphere of influence covering a large amount of present-day Northeast China, Russia’s Littoral Province and two thirds of the Korean peninsula. Inside the huge sphere of influence were Khitan, Malgal (Moho), Jiduwu, Silla and Ye in the form of vassal or tributary states. Koguryo at this time was a great empire that took pride as the guardian of international order and the most sacred state under the sun. Koguryo, in the fifth and sixth centuries, was one of the four great powers in East Asia, along with Yuyen, a nomadic empire; Northern Wei, a state set up by the Seonbi tribe in the Huang River basin, and Song, a state established by Han China in the Yangtze River basin. Unlike Northern Wei and Song, which were persistently buffeted by wars and other disturbances, Koguryo was able to nurture a high quality culture, while enjoying peace. Indeed, Koguryo culture exercised a significant impact on Baekje, Silla, and Japan. In early sixth century, Northern Wei, ruler of North China, likened Koguryo to a large wine barrel, and recognized the world of Koguryo’s independent dominion east of the Great Wall. Even in its heyday, a crisis once befell Koguryo. There was a series of confrontations among the nobility over the succession issue in the 540s. Taking advantage of this domestic disarray, the newly emerging nomadic power, Tuchueh, launched an attack from the north in the 550s and Baekje and Silla attacked from the south. Koguryo in the end had to cede the mid-section of the Korean peninsula to Silla and concentrated its efforts on repulsing Tuchueh, and was victorious. 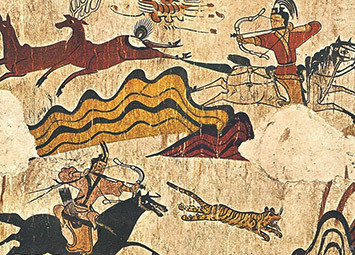 A more serious challenge descended upon Koguryo during the second half of the sixth century. The four-power set-up in East Asia was collapsing, when the new Sui Empire emerged. Sui managed to unify numerous nations competing for supremacy in the Huang and Yangtze River regions and even destroyed Tuchueh, who had been ruling the northeastern plains. This led Sui forces face to face with Koguryo, which was still pursuing expansionist policies. In preparation for a war with Sui, Koguryo collected lots of information, spurred on weapons development, strengthened its internal cohesion and braced itself for a war. In 612, Sui attacked Koguryo with millions of troops. 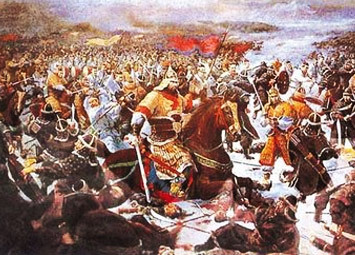 Koguryo scored a major victory at the battle of Salsu River by annihilating most of the 305,000-strong Sui troops. Subsequently, Koguryo successfully repulsed three more major attacks. Ultimately, this series of defeats led to the downfall of the Sui Empire itself. Thirty years later, Koguryo had to wage a war against the Tang, the Chinese successor to Sui. In 645, it repulsed hundreds of thousands of Tang forces in combats at the western frontier’s strategic points of Sinseong, Geonan and Anshi fortresses and Mt. Jupil. The commander of Chinese forces was King Taejong himself, known as the greatest king in Chinese history. In 661, mobilizing hundreds of thousands of troops, Tang again came attacking Koguryo, but its ambitions were frustrated the following February as the main component of Chinese forces was routed. All great powers in history perished in the long run. And, Koguryo was no exception. Yeon Gaesomun, who seized power in 642, was a great general. He led Koguryo to victory in wars against Tang in 645 and 662. But, he also left the legacy of dictatorship. Dictatorship narrowed the scope of political recruiting and rendered the state insensitive to new international developments. Furthermore, after Yeon Gaesomun died, a power struggle broke out among his three sons over the succession of the throne and this internal dissension threw Koguryo into doom. Lost out in the power struggle, the first son, Namsaeng, surrendered to the Tang forces, and revealed highly classified information about Koguryo. Repeated wars against Tang weakened Koguryo’s production base. In addition, Koguryo leadership was split within itself and betrayal and distrust spawned amid dictatorship. Unable to withstand the onslaught of allied forces of the Tang and Silla, Koguryo finally collapsed in A.D. 668. The after-effects of Koguryo’s downfall were profound. With the exit of Koguryo, which used to form an axis of multi-polar civilizations, the Tang-centered uni-polar civilization emerged in East Asia, which in turn came to develop as the East Asian international order. After the fall of Koguryo, many Koguryo people tried to revive their country. And, after 30 years of trying, Balhae(Pohai) was founded in 698 by Daejoyoung, a descendant of Koguryo. In official documents the king sent abroad, Balhae (698-926) used to boast itself as the successor of Koryo(Koguryo). (In the latter half of Koguryo Kingdom, people used to call their country “Koryo(Goryeo).”) And, the kingdom of Koryo (or, Korea) (918-1392), which succeeded Balhae, resurrected the name of “Koryo,” which was the state title of Koguryo. The Forgotten Glory of Koguryo Reviving! 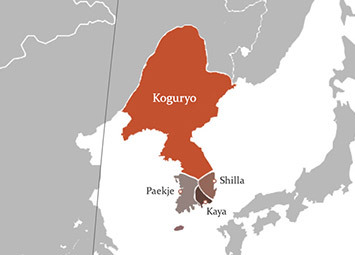 Koguryo is the origination country of Korea found in B.C. 37 and lasted for 705 years until 668 A.D. We, Korean people, take great pride in Koguryo and its monuments added to UNESCO’s World Heritage list on July 1, 2004. It is beyond question that Koguryo is an ancient Korean kingdom whose territory extended from mid part of the Korean peninsula and the greater part of Manchuria to eastern Monglia and Beijing as well. Recently, China has claimed that Koguryo is a part of its own history, a blatant infringement on the Korean history. However, history always tells truth and the alleged scheme to change the stream of history cannot stand the test of justice and will be paid for in the long run. Actually, the history of China is within the boundary of “Great Wall.” The first Qin Emperor constructed the Wall on the Qin(Chinese) border. Beyond that were a lot of neighboring countries including Tungus, Turkish, Mongolian, and Mohammedan countries, and Joseon(Korea) with different culture and language. 1) A 627 cm stele to king stele to King Kwanggaeto in Tonggou, Jianxian, China, Constructed in A.D. 414.